3. Ginger helps reduce nausea and vomiting from chemotherapy. 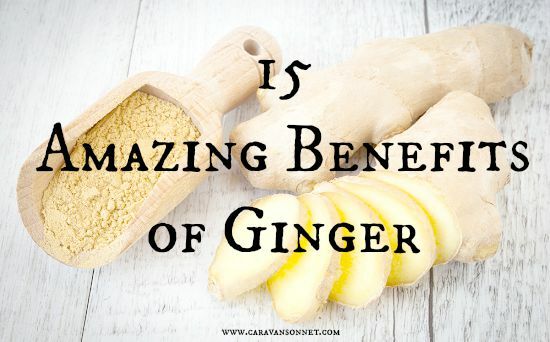 There have been many studies that have been done that when ginger is added to an anti nausea regime for chemotherapy that nausea and vomiting was reduced! 4. Ginger helps the body absorb essential nutrients. 5. Severe digestive issues or cramps? Ginger has been known to help digestive issues and cramps! Ginger has been found to be as effective as ibuprofen in help relieve pain from menstrual cramps in women (see #6!). Another benefit to ginger is that it may help prevent stomach ulcers which can be caused by non-steroidal anti-inflammatory drugs. 6. Ginger helps reduce pain. Ginger is anti-inflammatory and recent studies show that ginger has anti-inflammatory properties that may rival non-steroidal anti-inflammatory drugs. In a study done in 2013 on women's athletes it was found that those that took 3 grams of ginger each day had a significant decrease in muscle soreness and muscle cramps. In addition to muscles though ginger has also been found to help with migraine headaches. 7. Ginger can help reduce nausea from morning sickness. Recent studies have shown that ginger can help reduce pregnancy-related nausea. 8. Ginger can help Osteoarthritis. 9. Ginger may help lower blood sugar and improve heart disease risk factors in patients. Although the studies on this are very new (just started in 2015) doctors are now saying that ginger may help diabetes and heart patients. Ginger appears to help with insulin release and insulin action in the body and helps improve lipid metabolism. Another clinical trial done recently shows that those who consumed ginger had a marked difference in many of their levels. It will be exciting to watch in years to come what future studies say about this! 10. Ginger helps improve circulation. 11. Ginger can help inhibit certain bacteria, including Salmonella. Ginger is a great item to add to your kitchen as it an help prevent sickness due to salmonella! 12. Ginger helps fight Cancer. Due to the anti-inflammatory properties that ginger contains it is beneficial for many chronic illnesses including Cancer. A recent British study shows that Ginger can help in the effective management of certain Cancers, including prostate Cancer. Other studies have shown that it helps promote anti-tumor activity that can help treat even the difficult to treat types of Cancer. In addition to this a study that was performed at the University of Minnesota found that ginger can help slow the growth of colon Cancer cells. 13. Ginger helps reduce vertigo. Studies show that regularly consuming ginger or ginger tea can help reduce vertigo. 14. Ginger helps reduce the chance of a stroke and the damage done due to strokes. Taking ginger may help reduce the effects that a stroke can have on the body. 15. Ginger helps strengthen the immune system. Along with other wonderful foods, ginger can help improve the immune system. While using fresh ginger is a wonderful idea, ginger can also be used dried, powdered, or even as an oil (or tea). Do you use ginger? In what form have you found it helpful? Have you found any benefits to consuming ginger? I use ginger on a regular basis as I struggle with inflammation in my body due to food allergies. It truly is wonderful and I think more people need to learn about it. So glad you shared this. I am so glad to hear that you use this Sheryl! Do you might me asking in what form you use it in? As a lady who struggles with inflammation I take it orally, use it fresh and dried, but am always looking for ideas and thoughts! :) Thanks so much for sharing and taking the time to comment!! I ate a LOT of ginger lollipops during treatment because it helped with my nausea ! It really worked! I add some ginger to my tea when I have it to help with a number of these things with my illness! I love adding ginger to my tea too!! :) Thank you so much for sharing that it helps you too!! :) I hope that you are having a wonderful day today lady!! Thank you so much for stopping by and leaving a comment! :) I am so glad that you found this informative!! :) How do you use ginger mainly? :) Hope you are having a wonderful week! ooh adding it to Kombucha is a GREAT idea!! :) Thanks for sharing friend!! :) I hope that you have a wonderful Friday and weekend!! When my throat is a little scratchy I slice up fresh ginger and steep it in boiling water, then I add lime juice and honey. It kicks the problem right out of the park! That is a great idea Megan! :) I typically sip on ginger tea at nighttime but haven't added in the lime or honey. I will have to keep that in mind! Thank you so much for sharing!! That is so great that you enjoy the taste! I have to admit that I don't always enjoy the taste! *smiles* Thanks so much for stopping by and sharing your thoughts!! I definitely believe that ginger is great for health. During my mom's last pregnancy (I have a sister almost 16 years younger than me), our househelper cooked meals chock-full of ginger all the time. The one problem is that I really, really don't like the taste. To this day, something about the flavor I don't like, so I can only use it in dishes like curries that mask the flavor. Rachel, Thank you so much for stopping by and sharing your thoughts! I do agree with you that sometimes the taste for me can be difficult to handle! I love your idea about putting into some dishes like curry! Thanks so much for the tip!